Imagine you’re a skipper on one of the Jungle Cruise riverboats in Magic Kingdom. You’ve had a long day pointing out the backside of water and shouting “Shoo! Shoo!” at that menacing hippopotamus. But finally, your boat is docked. Where are you going to go for a drink and dinner? The obvious choice: Jungle Navigation Co. Skipper Canteen. This new table-service restaurant opened in December 2015 and (the story goes) started off as a spot for the skippers to eat, with private rooms that were opened up for guests. Now it’s open to all. 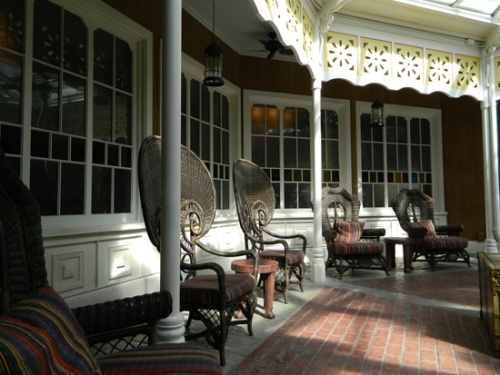 Eager diners walk up to a broad white-painted front porch surrounded by greenery where they can check in. The cozy wicker chairs at the entrance give you a relaxing place to wait if the rest of your party is a bit slower to arrive. (Okay, I admit it, I actually dozed off while waiting!) It definitely has that dining-in-the-jungle feel. We had a party of 11 (with ADRs) and as soon as everyone arrived we were quickly taken to a table large enough for everyone. The inside of the restaurant replicates the exotic feeling of that front porch, but has dark wood walls, floors and tables, making the room feel pleasantly cool on a hot day. Our friendly server was one of the best we’ve had: she interacted well with the children, was very knowledgeable about the menu and kept us laughing with jokes and Jungle Cruise stories. The décor fits the story perfectly, with artifacts from the various locations on the Jungle Cruise ride, books with intriguing titles on the library shelves, an exotic butterfly collection and more. When the little ones were restless, we took them for walks around the restaurant to see more of the items on display. If you enjoy restaurants with plenty to look at, this is likely to become one of your faves! There is even a “Kungaloosh!” dessert for fans of the much-missed Adventurer’s Club. I’ll confess that Magic Kingdom has long been my least favorite park for meals, but the Canteen has kicked it up several notches. The food we had was excellent, with plenty of spice and flavor, and there were options that pleased everyone from the vegans in our group to the somewhat picky little kids. I had the Curried Vegetable Crew Stew and was delighted to find that the sauce was delicious and the vegetables were all cooked perfectly. The Canteen is now on the top of our list for future WDW trips – we can’t wait to try it again. 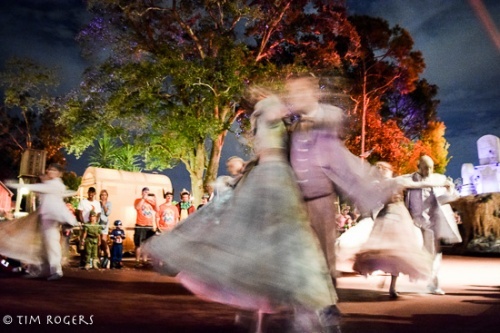 As I was getting ready to plan our next trip to Disney World, my mind wandered to previous trips and some of my favorite things that are no more. 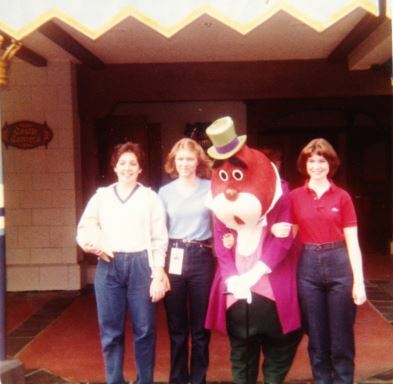 I began to dig through scrapbooks and photo albums, searching for pictures of long-gone attractions and shows that my family and I had enjoyed through the years. Here are a few of my favorites! We loved collecting these as we waited for our next Disney trip. Although they are no longer available, Disney will still honor any you might have. I think I’ll keep these, though; the memory is worth more than anything the dollars might buy! This is a pamphlet dated 1983. A one-day pass to Magic Kingdom or Epcot was $15 for adults, $14 for juniors, and $12 for children. We never made it to River Country, but Discovery Island was amazing! I still remember my mom posing for this picture, and shortly after it was taken being bitten by an emu she was trying to feed. Being an animal lover, the day we spent here was pure joy for me. I was very sad to see Discovery Island close, but I take every chance I can to visit Animal Kingdom! This is from the newspaper Disney used to print for guests, dated March 4-17, 1983. As I’ve said before, these two characters and the original Journey into Imagination were my absolute favorite things about Epcot. We always set aside time to play in the pavilion after the ride, and I was thrilled when my kids were able to get a picture with Figment on one of our trips. I really believe that if the original ride came back, people would fall in love with it again! This little folded pamphlet included tips on planning your visit and a list of Epcot Center counter service restaurants. 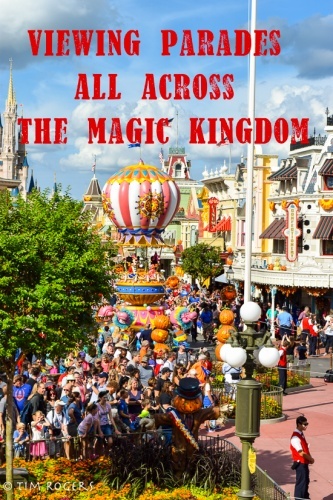 Some of the tips inside it were: “Visit Magic Kingdom in the morning and Epcot Center in the afternoon. Take in the wonders of Future World later in the day. Make your dinner reservations at Earth Station before 10 A.M. World Showcase dinner reservations may also be made at City Hall in the Magic Kingdom.” My, how things have changed! Can you imagine Le Cellier as a counter service spot? 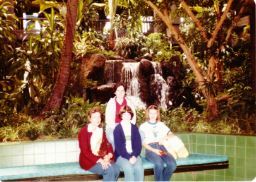 My family took a picture in this spot every time we were in the Polynesian. It was truly one of my favorite places in the World; beautiful, serene, a kind of oasis in the middle of busyness. Although the new lobby is also beautiful with its wide-open spaces and bright colors, this may be the thing I miss the most. While I realize that having a schedule for character appearances makes it easier to plan your day, happening upon a character as he (she? it?) walked through the park was always a fun surprise. We always felt like we had won a prize if we were the first or second in line when a character appeared. Even if you didn’t necessarily know exactly who it was…. Does anybody know who this is?? Of our favorite rides, although more recent than the other memories. I do love “Frozen”, but I am sad that people will not get to ride through the beauty that was Maelstrom, and was very sorry to see it “Disappear, Disappear”! Although I am definitely looking forward to the new “Frozen” attraction on our upcoming trip! Well, enough reminiscing for one article. 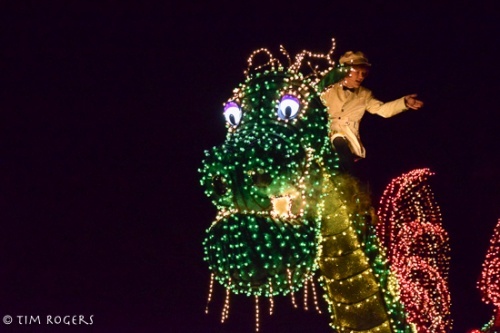 I’m still looking for pictures of other favorites: Orange Bird, Horizons, World of Motion, Mr. Toad’s Wild Ride….what are your favorite bygone attractions at Disney? 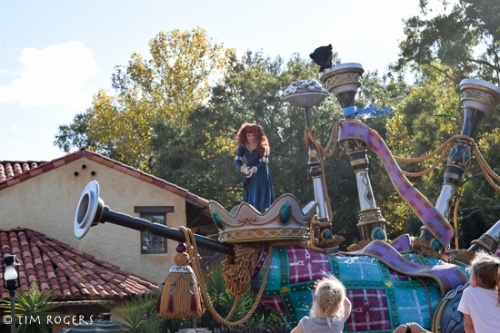 A big part of any day in the Magic Kingdom is the parades. 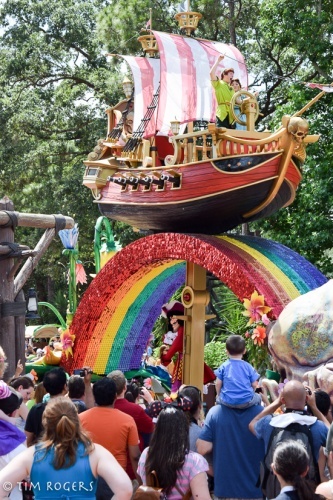 For some, parade time is a great chance to get to the more popular attractions with less of a wait, but for many guests, the parades are a must-do for their trip. 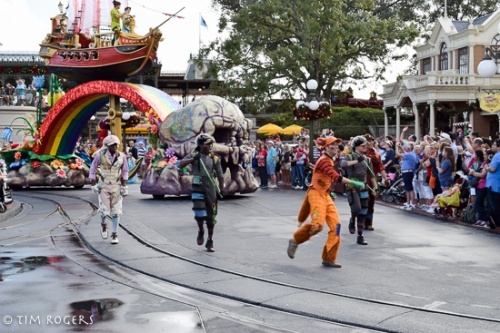 However, even if you have seen a Disney parade before, a great way to get a new experience is to change your viewing location. 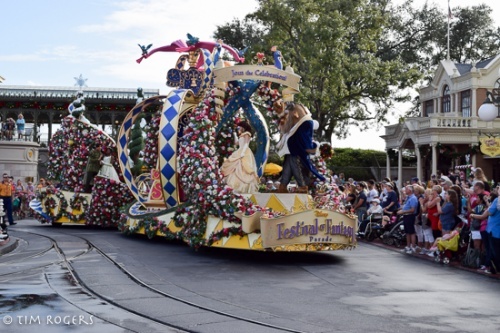 In the Magic Kingdom, all of the parades use the same route, and most go in the same direction, from Frontierland, through Liberty Square, to Main Street (the Main Street Electrical Parade, while it is still running, begins on Main Street and goes through this route backwards). 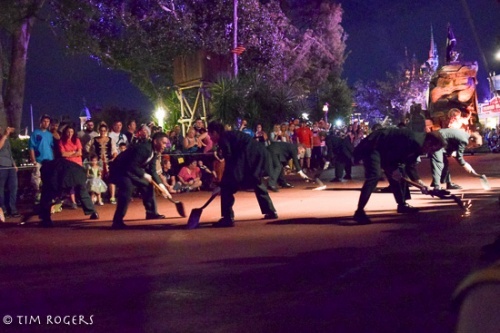 While you are thinking of where you want to be, or trying to get a good spot, watch about an hour or so before the start of the parade, when Cast Members begin taping walkways and putting up rope lines – this will tell you exactly where you can be. 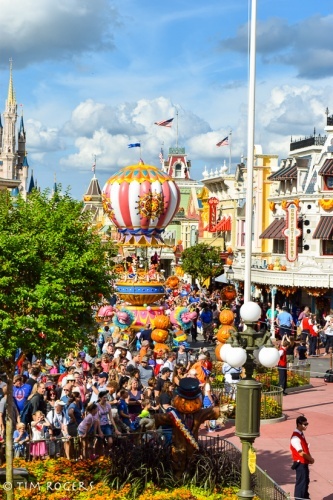 But for picking a spot, let’s start where every Magic Kingdom day begins – Main Street U.S.A. Main Street is probably the most obvious place to want to see one of the Disney parades, if for no other reason than you get the castle in the background. However, some of the spots on Main Street also fill up the earliest, so having a slightly different plan can give you a new experience. 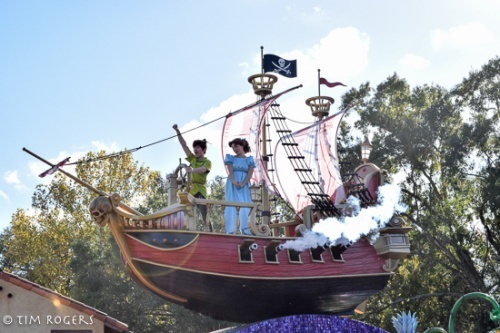 The first time I was able to see the Festival of Fantasy parade we tried to position ourselves near the end of the parade route. Start by hanging out near the park entrance next to the Emporium and Harmony Barber shop. If you are in this area, watch for a Cast Member to put a post up in the middle of the street and start running a line toward the exit to back stage. As the parade comes around the circle it will turn to wards the gate between the fire station and the barber shop. If you can get a spot on or near that post you will get some great straight on views of the whole parade, and some wonderful interaction with the characters on foot. The second spot on Main Street I wanted to mention is the upper level of the train station. Sometimes the front of this can fill up early, but the sides often have some space. Especially with the height of some of the newer floats, watching them from the same level can be really fun and let you see details you missed before. Outside of Main Street, the next place I have had a great experience is near the border of Liberty Square and Frontierland along the storefronts between the Frontier Trading Post and Diamond Horsehoe. This area is good for a few reasons. First, for parades beginning in Frontierland you get to see them at a slight angle so you can see them from the front as they approach and the side as they pass. Second, the porches here give multiple levels of viewing, so more good spots are available for longer. A hidden benefit of this area is that you are right next to the passage to Adventureland, so you have an easy escape when the parade ends. We started near the backstage gate on Main Street, and we will end at the backstage gate in Frontierland. I’ve seen parades here from both sides, first by Pecos Bill’s and also on top of the hill by Splash Mountain. Especially for parades ending in this location, you can get some nice views with the added benefit of jumping into Pecos Bill’s for a restroom or delicious cuisine. 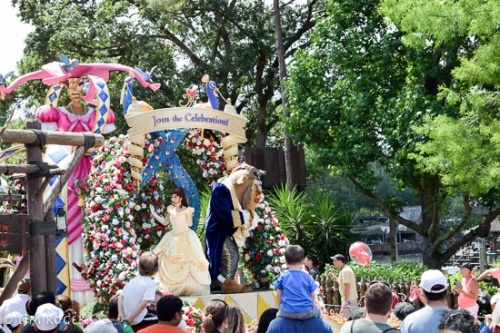 Viewing parades in the Magic Kingdom can be a lot of fun, but branching out across lands can make each viewing a brand new experience – so go check out your own! Fall is in the air. Can you feel it? Ok, maybe it’s still technically summer, but school is back in session and pretty soon, pumpkin-spiced EVERYTHING will be everywhere you turn. 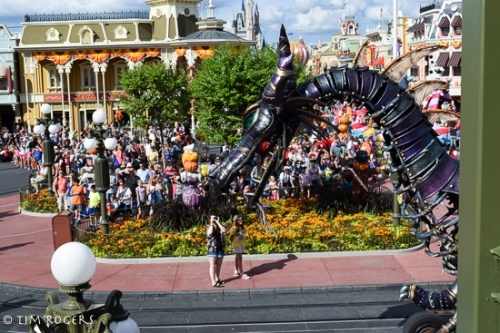 If you’re planning on visiting the Walt Disney World resort in September or October, you will undoubtedly be there during a special ticketed event at the Magic Kingdom known as “Mickey’s Not So Scary Halloween Party”, or MNSSHP for short. 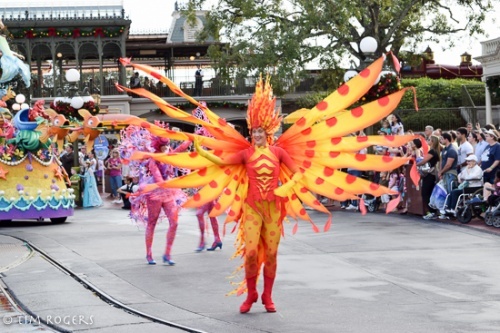 This event is full of special parades, shows, fireworks, trick-or-treating, character meet and greets, party-specific merchandise and treats, and little to no wait time for select attractions. This event is always a hit, and is a fabulous way to get into the Halloween spirit! 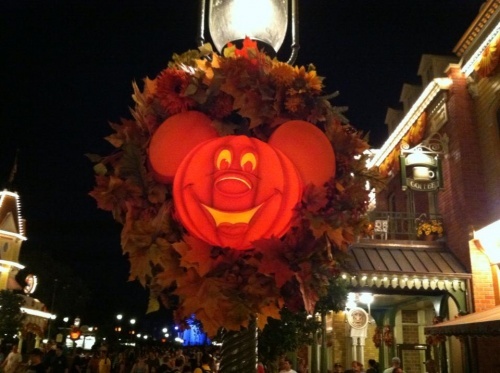 We are attending one of the parties this year, so here are my top 5 tips for getting the most out of your MNSSHP experience! Depending on the date you choose, adult ticket prices can range from $72 to $105 if purchased in advance ($67 to $100 for children), or $79 to $105 if purchased on the event day ($74 to $100 for children). 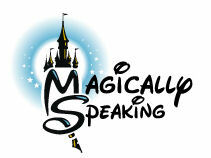 So save yourself a few dollars and purchase your tickets in advance on the Walt Disney World website. This will also save you time by being able to skip the ticket counter at the Magic Kingdom, and prevent the potential disappointment of the party being sold out when you arrive. There are only a select number of tickets available for each party, which helps keep the crowd levels low. BONUS TIP: Even though the party begins at 7:00 p.m., Cast Members have historically allowed entrance to the party as early as 4:00 p.m.! If you purchase your ticket in advance, add it to your My Disney Experience account, and you can add up to three FastPass+ selections to use before the party starts! Your FastPass+ selections can be between 3:30 p.m. – 4:30 p.m., 4:45 p.m. – 5:45 p.m., and 6:00 p.m. – 7:00 p.m., with no additional admission ticket required! Of course, this is historical information, so it’s all subject to change at any time. But, this allows you to have a nice restful day swimming and relaxing at the hotel, and then a full 7 hours at the Magic Kingdom starting at 4:00 p.m.! Because of how hot and humid Florida can be in the fall, and of course there’s always the potential for rain, choose a costume that is comfortable and can be covered with a poncho if necessary. Disney bounding, aka dressing in normal clothes that are inspired by a Disney character, is a popular choice, as are family-themed costumes (like the whole cast of Finding Dory). But don’t feel like you HAVE to dress in costume- you don’t! My husband and I will be Disney bounding this year, dressing up as the Walt Disney World Swan and Dolphin Hotels… because we’re completely normal… Ha. Trick-or-Treating with a special diet? No problem! 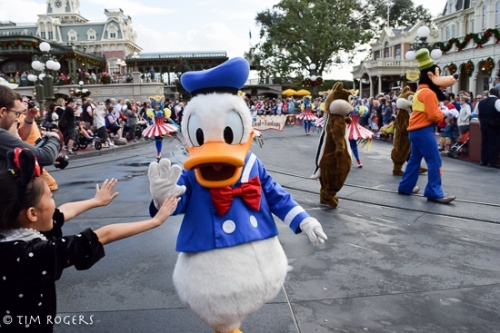 Disney is known as being the ultimate destination for guests with special needs of all kinds. If you’re attending MNSSHP and have food allergies, but still want to participate in the Trick-or-Treating fun, bring the bag of candy back up to City Hall and exchange it for some special diets treats! Or if you don’t want to Trick-or-Treat at all, head straight to City Hall upon arrival and pick up your goodies! These treats are generally “Big 8 Allergen” friendly, and sometimes aren’t even edible at all (think pencils, stickers, small toys, etc.). To make sure that special diet treats are available during the party you will be attending, you can email Special.Diets@DisneyWorld.com. They always have these available at every party, but they can sometimes run out if there’s a lot of demand. Stop by early in the party, just in case! 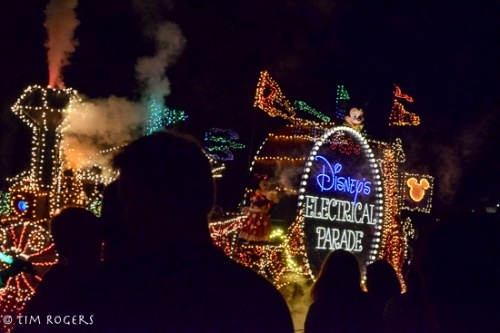 The most popular parades and shows are the first ones of the night. 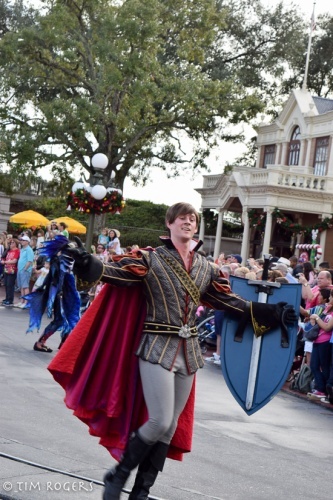 If you want to meet characters that are only out during the party, like Jack and Sally or all Seven of the Dwarves, get in line for THEM early (I suggest 6:00 p.m.), rather than getting a spot for the first parade or castle show. 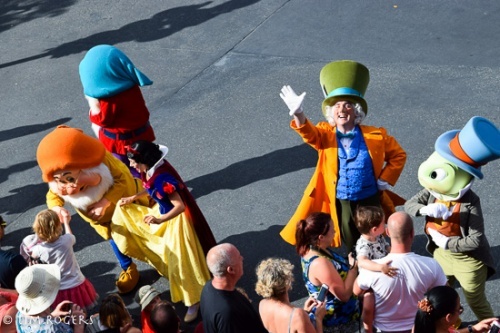 You’ll be able to meet the character you want to meet, and have fewer crowds around you when the later show or parade rolls around. In regards to the best places to stand for the parade, I prefer Frontierland or Liberty Square over Main Street. These areas seem to be less crowded. Of course, riding rides at MNSSHP is not high on everyone’s to-do list, but for those that prefer taking advantage of the more popular attractions with little to no wait time (like us), this is something to keep in mind. A few of the popular attractions, like the Jungle Cruise are not open during the party, so these would be great attractions to use those FastPass+ selections on before the party starts. 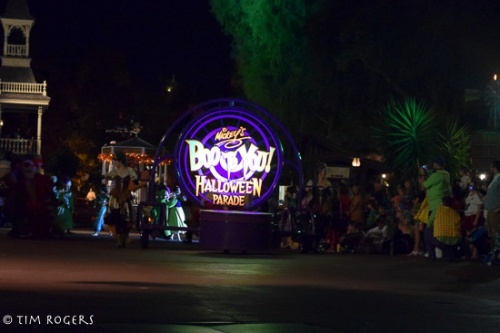 This year’s MNSSHP map is not yet available, but you can see last year’s map here. So there we have it! 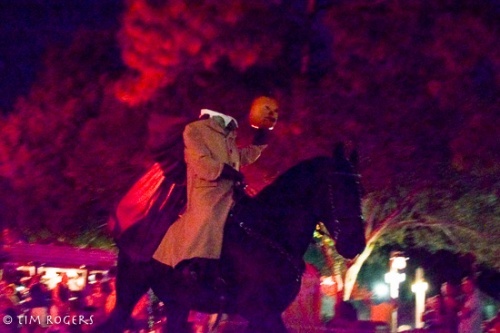 What are your tips for making the most out of Mickey’s Not So Scary Halloween Party? Are you planning on attending this year? Let us know! Disney Springs is fast becoming a destination for dining within Walt Disney World’s property, especially with so many new restaurant destinations. My family’s favorite spot in Disney Springs is not a new one however. We love everything about Raglan Road Restaurant. Raglan Road is an Irish pub, but don’t let the theme fool you. This is not an adult-only venue. It is family-friendly, and it’s not just a place to grab a beer (though you may want to enjoy a selection from their beautiful bar if you’re of age). Raglan Road will give you the true Irish pub experience, with food from Irish chefs and décor which was imported from the homeland. The restaurant also has Irish entertainment throughout the evenings, including Irish step dancers from 4-9 pm and live bands that perform both on the restaurant’s indoor stage and their outdoor patio. The décor is one of my favorite parts of this location. It is covered with wood paneling, stained glass windows and brass light fixtures. The mirrored bar serves a vast variety of beers on tap or by the bottle, wines, hard liquors and cocktails. I am especially fond of their beer flights, but if whiskey is more your speed, they have whiskey flights as well. While you can be seated at the bar, there are also tables and large booths located in several rooms. The food here should not be minimized though. Raglan Road’s kitchen puts out some really tasty dishes. Each table is brought a serving of brown bread with Guinness dipping sauce. This never seems to last on our table- it is slightly sweet and a great starter. Speaking of starters- there is a large selection of appetizers on the menu, including a scotch egg, steamed mussels, baby back ribs, and a soup of the day. My favorite choice though, are the “nom nom wings,” which are some of the best wings I’ve found at Walt Disney World. They’re spicy and sweet- crunchy on the outside and meaty on the inside. Many of the appetizers are also available at the bar as “late night snacks” even after the dining room stops serving. The entree selections at Raglan Road are upscale versions of Irish home cooking. The Raglan Risotto is a perfectly cooked risotto with fresh peas, pecorino and mozzarella cheese. It’s light but also creamy, and a large portion. The fish and chips is a large piece of fresh fish, deep fried in beer batter. It’s a great representation of what I’ve eaten in the U.K. Those who aren’t adventurous at all, should consider the “Serious Steak”, which is a perfectly cooked strip steak with mashed potatoes and beer battered onion rings. Each night, Raglan Road offers a different pot pie selection, and this has gotten rave reviews from our family. The chicken pot pie that we had on our last visit had large chunks of chicken, vegetables, a delicious sauce and flaky crust. Best of all, the pot pie had mashed potatoes hiding at the base, which my husband loved. The menu is full of options though, including roasted chicken, ham, lamb shank, seafood chowder, chicken curry, baked salmon and confit duck leg. The Raglan Road children’s menu is equally as diverse. They can choose from classics like chicken fingers, cheeseburgers or mac and cheese, or try out more authentic options like risotto, shepard’s pie or baked salmon. The children’s portions are huge, and we have easily split them between two young children, or taken leftovers back to our rooms for another day. If you’re not too full from dinner, Raglan Road also has a great dessert menu which includes a decadent bread pudding, flan, an apple/berry crumble, trifle, and whiskey coated berries with ice cream. My personal favorite is the Dunbrody’s Kiss, which is a chocolate lover’s dream. I highly recommend this restaurant for lunch or dinner. It’s a great spot to have some delicious food and to take in a show from the dancers or the bands. Reservations are strongly recommended. This restaurant takes one credit on the Disney Dining Plan and accepts discounts from Disney Vacation Club and Tables in Wonderland. Try it out on your next Walt Disney World vacation. I know we already have reservations for our next trip. Food! Yes that is one of the many reasons I love visiting Walt Disney World. This June my family of four along with my parents, sister and brother-in-law all headed down to the Most Magical Place on Earth. We had the Disney Dining Plan which provided us one table service, one quick service, and one snack per night per person. We used this to our advantage taking in some of Disney’s great restaurants. Here is a look at where we went and what we liked and disliked about each of our table service experiences. Tusker House is located in Africa within Animal Kingdom. It offers all three meals throughout the day all in buffet form. We had lunch reservations at Tusker House where we were able to experience a variety of food from Africa as well as traditional food like mac and cheese and corn dog nuggets. Another great appeal of Tusker House is that you are able to meet a variety of characters while dining. While we dined we met Donald, Daisy, Goofy and Mickey. 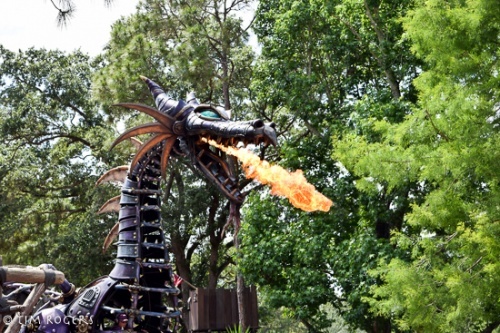 Here are the good and bad of Tusker House in our opinion. For the food we loved the mac and cheese and corn dog nuggets. I know it seems silly that we went all the way to Disney to eat at an African themed restaurant and then eat the American classics, but they were just so good. I personally loved the Jungle Juice. This drink is the perfect combination of orange juice, guava juice and passion fruit juice making it amazingly refreshing on a hot day. Our service was amazing and so helpful as this was our first dining experience on the trip and with three resort reservations, she was super helpful making sure we did everything correctly. The buffet set up isn’t the best to navigate. Many feel like it is one big line causing a slow moving process instead of understanding you can jump in wherever. We wished this was explained more to people as some dirty looks were sent our way. Character interaction wasn’t great, but not awful either. just average. They took pictures and signed autographs, but there wasn’t anything overly exciting or special about the interactions. We felt the seating areas were tight and felt overwhelming as they areas get busy with guests and characters coming and going. Don’t need to do it again but thought it was a good experience once. Cinderella’s Royal Table is one of the prime dining experiences for many while at Walt Disney World. It offers all three meals throughout the day and guests order off a set menu at each of these meals. We once again had lunch reservations at Cinderella’s Royal Table. The atmosphere is absolutely amazing as you are in the amazing and magical castle. Our character interaction was wonderful as each princess made special comments to our daughter about her birthday. I felt they took their time with us which was nice and made the experience fun for all of us. Our food was outstanding to say the least. The meat was tender and full of flavor. We felt that we had some nice dessert options as well here from the lemon sorbet to the Clock Strikes Twelves chocolate cake everyone could find something they liked. Our server was once again amazing. She took great care of us and my dad and husband got a kick out of being called lord the whole time. The noise level seemed high here and it might have just been the buzz from all the excitement. The princesses are announced before coming out and you can barely hear anything. There is also a time when the kids are asked to make a wish but you couldn’t hear what was being said. I felt out of the three character meals we had, this was the loudest setting. Cinderella’s Royal Table is a 2 credit meal which some might find hard to do. We felt that the food, atmosphere and seeing the princesses was well worth it for us. I would continue to eat here for the food alone. We all thought it was delicious and it was great to feel like royalty. Liberty Tree Tavern is located in Liberty Square within in Magic Kingdom. This wonderful gem is opened for lunch and supper offering a variety of traditional American meals that customers can choose from while dining here. We had late lunch reservations at Liberty Tree Tavern. Oh my the food. It is so good no matter what your order. From the Pilgrim’s Feast to the kids Mac and Cheese all eight of us loved the food. Not only the main dishes but the desserts were delicious as well. From the Johnny Appleseed dessert to the sorbet there was a nice variety offered. Our wait to be seated was the longest at Liberty Tree Tavern. I believe that it was due to the fact that we were a large group and it is hard for them to seat large groups, so keep that in mind it you are a bigger group traveling together. Our service was lacking at Liberty Tree Tavern as our server was not friendly or magical at all. She asked for us to stack our plates and wasn’t happy when we asked for waters or refills. She also forgot our birthday celebration which was stamped on our ticket. Having three different room reservations for the dining plan seemed to throw her off as well but it turned out fine. Bathrooms at Liberty Tree Tavern are not the easiest to get to either. They are located upstairs and there is a small hallway I would call it that you have to wait in usually because there are only two stalls. Although there are a number of things that we thought didn’t go the best, I wouldn’t judge Liberty Tree Tavern on that alone. The food is so delicious that it has easily become one of our must dos while there. One of the newest and definitely one of the most sought after reservations at Magic Kingdom is Be Our Guest located in Fantasyland. This French based restaurant serves meals throughout the day. Breakfast and lunch are quick service meals where you order ahead of time whereas the evening meal is a sit-down and order. We had evening reservations at Be Our Guest. Service was again great at Be Our Guest. We actually had two reservations of four each but they were willing to accommodate us with a short wait and get us seated together. Our server was prompt and friendly throughout the meal. The atmosphere in Be Our Guest is amazing. The details that they put into the three different dining rooms are straight from the movie. The Beast, in the evenings, is also present to welcome guests and take pictures. This adds to the wonderful atmosphere. This is the second time we have eaten at Be Our Guest and both times we haven’t been overly impressed with the food. The menu is limited, not unusual for a table service restaurant, which doesn’t bother us as much as the fact that what we do get seems to be very average. Although we were willing to hide the basket of bread for later because it was so good, our main meal of steak, salads and shrimp and scallops were very average. If you are not a cupcake fan, dessert is limited as around half of your dessert options are cupcakes. Now that everyone has eaten at Be Our Guest and experienced the Beast and the amazing atmosphere, I don’t believe we will head back. That is hard for me to admit as Beauty and the Beast is my favorite movie and the castle is done to perfection but I feel like there is better food out there. Chef Mickey’s is a buffet served at all three meals located near Magic Kingdom at Disney’s Contemporary Resort. American food is the focus here with Mickey waffles and an ice cream bar being the highlights. I absolutely loved our character interactions at Chef Mickey’s. Each of the characters we saw (Mickey, Minnie, Pluto, Goofy and Donald) spent a great deal of time with us and gave us a unique interaction. My son got a kick out of how Goofy forgot how to spell his name and needed our son’s help. These moments were some of my favorite and were handled so well by the characters and cast members. Although the food isn’t anything out of this world, I really enjoyed our options. We were there for brunch and that meant Mickey waffles and ice cream too. This was our only meal that we had breakfast food as an option so it was a nice change of pace for us. Service once again was great. At a buffet this is sometimes hard to accomplish because guests aren’t always needing their server but ours did a great job at keeping up with our drinks and taking our dishes. She also took care of our bill early on so once we had seen all the characters we could head out again. This restaurant is a huge favorite of kids so it does get loud at times with all the kids as well as all of the characters. I felt like this space was better for characters than Tusker House as it just had more room for the characters as well as the guests to move around. Bathrooms were hidden at Chef Mickey’s as they are downstairs. Lots of them available just not on the same level as the dining. I know many dislike Chef Mickey’s because the food isn’t great but I feel like it always has a nice variety and the character interaction is some of the best we had. ‘Ohana is located around the Seven Seas Lagoon at Disney’s Polynesian Resort. It offers a family style meal with Polynesian cuisine at both breakfast and supper. We enjoyed supper here during our stay. ‘Ohana means family and you definitely get that feel at the Polynesian. The atmosphere is so relaxed and welcoming that after long days at the park it is so comforting. The food at ‘Ohana is some of our Disney favorites. The honey-coriander chicken wings has the best flavor we have had while eating at Disney. Although we also enjoy the oak fired meats (shrimp, chicken, and steak) we all felt the chicken wings had the best flavor. We also liked that we could ask for more of whatever we wanted which was nice. Delicious drinks are also fun at ‘Ohana. They are known for their Pineapple Rum drink; however, we went another route and had the raspberry pina colada which was all sorts of wonderful. I am not sure we had a bad regarding ‘Ohana. Some might feel that the entertainment is a little over the top with the singing, however, we didn’t mind it. ‘Ohana is a must do on our trips to Disney! We love the atmosphere and the food! Part of why we love going to Walt Disney World is that we have the experience of all the different restaurants. We look forward to trying some new ones next time and hitting up our favorites again.